This hot water cornbread is a simple mixture of cornmeal and hot water with a few seasonings. The mixture is shaped into cakes and fried in hot fat in a skillet. Bacon drippings add smoky flavor these tasty corn cakes, but they can also be made with melted butter, shortening, or vegetable oil if you don't have the drippings or want to make them meat-free. 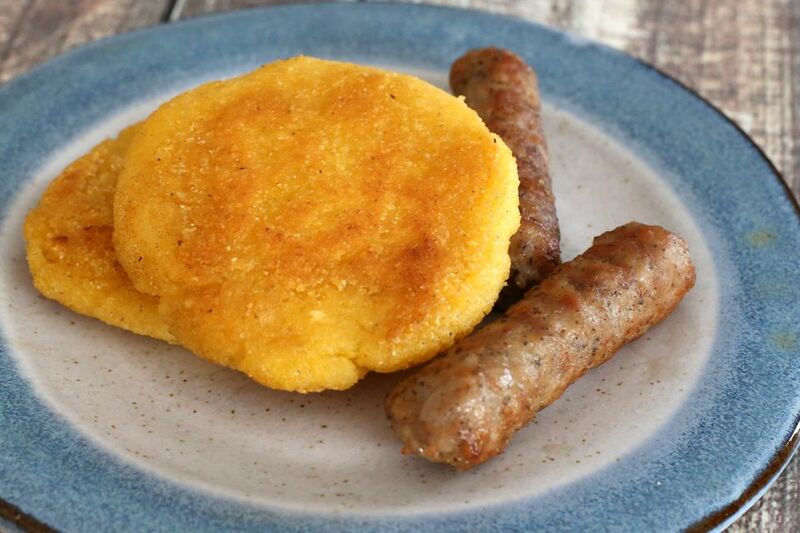 These hot water cornbread cakes are an old-time Southern staple, sometimes called hoecakes or corn dodgers. In New England and in other areas of the country they are called Johnnycakes or journey cakes. The term hoecake is found in writings as early as 1745. They are great with maple syrup, but they would also be delicious with molasses or a cane or sorghum syrup. Or serve them as a base with creamed chicken or turkey. They are also great with baked beans or chili. See the tips and variations below the recipe for some suggestions for add-ins and serving ideas. Put the water and salt in a medium saucepan and bring to a full boil over high heat. Remove the water from the heat and add the cornmeal, bacon drippings or butter, and sugar, if using. Stir until a stiff dough is formed. Let the mixture stand just until it is cool enough to handle. Heat a heavy skillet (preferably cast iron) over medium heat. Add enough shortening or bacon drippings to coat the bottom of the pan. When the fat is hot, shape the cornmeal mixture into thin cakes and arrange them in the hot skillet. Fry until lightly browned, turning to brown both sides. Instead of plain cornmeal, use self-rising cornmeal mix. Add 3 tablespoons of all-purpose flour to the cornmeal mixture to lighten the texture a bit. Bacon Cheddar Corn Cakes: Add a few tablespoons of crumbled bacon and 1/2 cup of shredded cheddar cheese to the batter and omit the sugar. Serve with poached or scrambled eggs. Green Onion Corn Cakes: Add 1/4 cup of finely chopped green onions to the batter. Jalapeno or Jalapeno and Cheese Corn Cakes: Add 2 tablespoons of finely chopped fresh or pickled jalapeno peppers. If desired, add about 1/2 cup of shredded Monterey Jack cheese with the jalapenos. These are really good with chili or beans. Corn Cakes With Corn: Add 1 cup of well-drained cooked corn kernels to the batter.